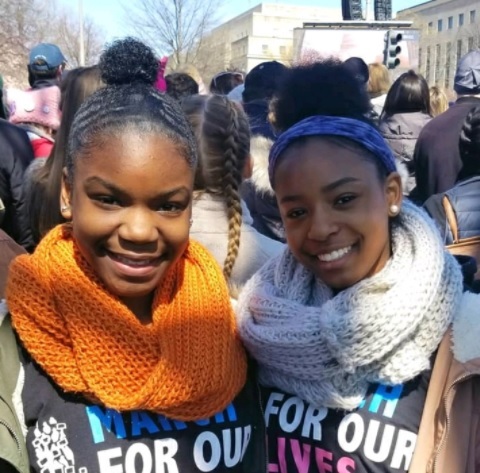 March For Our Lives - Mocha Moms, Inc.
Thousands of students across the country participated in the March for Our Lives rally across the country on Saturday, March 22, 2018. Among them were some Mocha kids, including 15-year old 9th grader Arija Martin. She was there in Washington, DC and posted this statement. I was proud to be part of March For Our Lives in Washington DC because it was organized and presented by students. I think it's important to mention that African-American kids have been trying to do this for a long time. It would have been wonderful to see this type of support during the Black Lives Matter movement. It's critical that we are trained on how to handle attacks in school. Our schools' WALK-OUT was incredibly sad hearing the names of the Parkland kids who were killed. But what about all of the names of the African-American kids who weren't read? We can't forget them. I appreciated 11 year old Naomi Wadler's speech and the speech by the Chicago student so that kids of all races were included in March For Our Lives. I felt completely empowered! March For Our Lives is about ALL children. We must continue to speak out against the NRA and gun safety. Our lives depend on it.